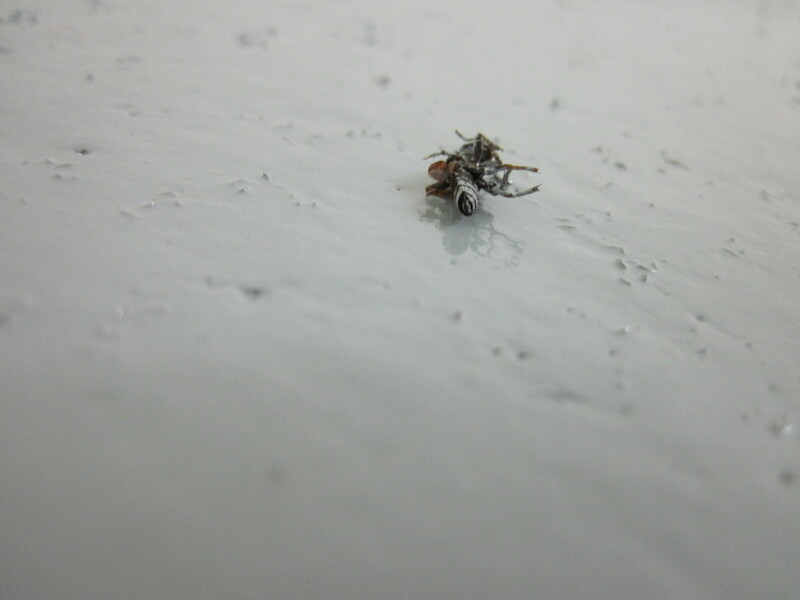 Yep, that’s a nasty picture of a bug stuck in epoxy on our garage floor. The good news is that we were able to wipe him up (except maybe one leg). 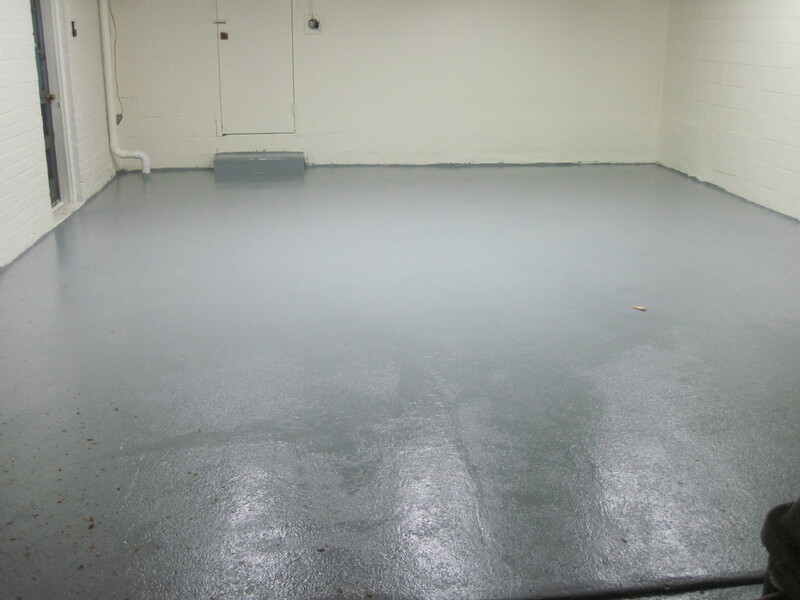 Oh, and more good news: our garage floor is finished! 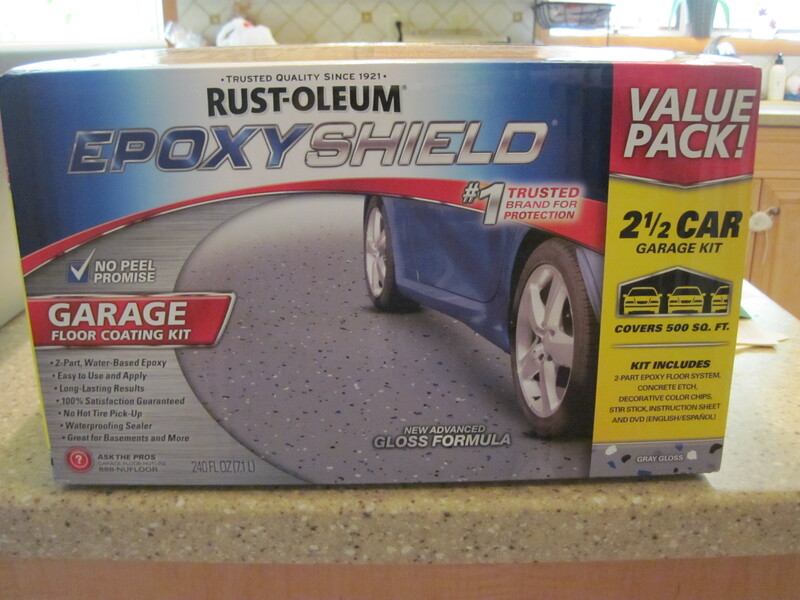 We ended up using Rustoleum’s EpoxyShield system. 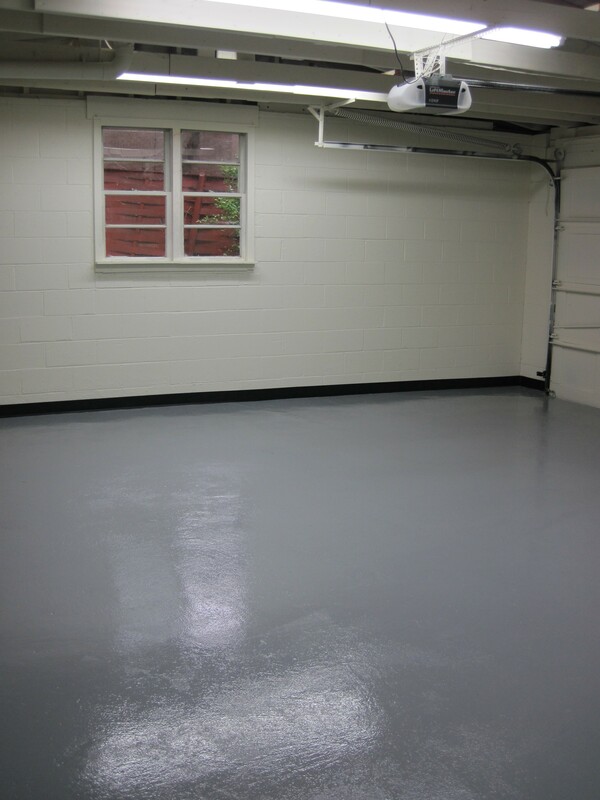 We considered Benjamin Moore’s garage floor epoxy as well as U-Coat-It and Epoxy-Coat.com’s coatings. 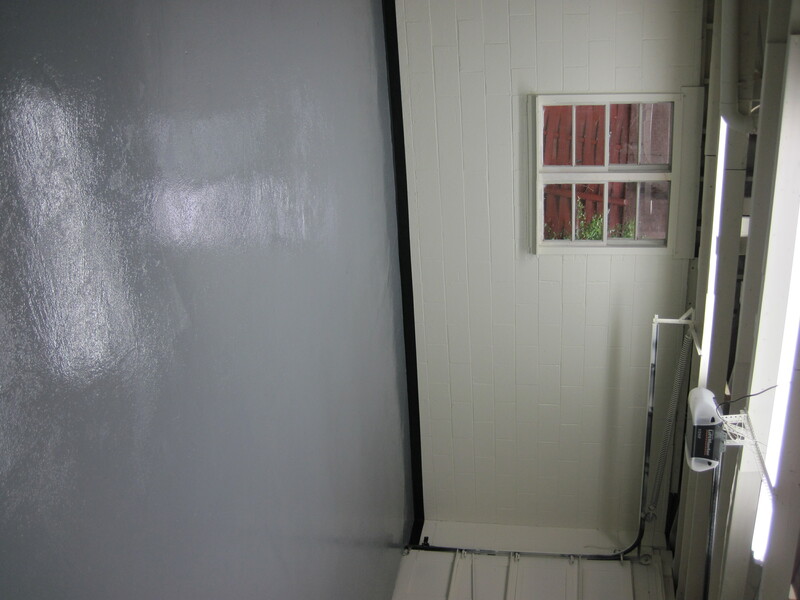 The reviews for all of the products included comments along the lines of “you’re going to have to re-coat your garage floor in 5 years” so we went with the Rustoleum system because it was the least expensive. Well, that and Kristin’s dad used it in his garage and has been quite happy with it. From the reviews we read, people seemed happiest with their results when they used two coats of the EpoxyShield and two coats of the EpoxyShield clear coat. 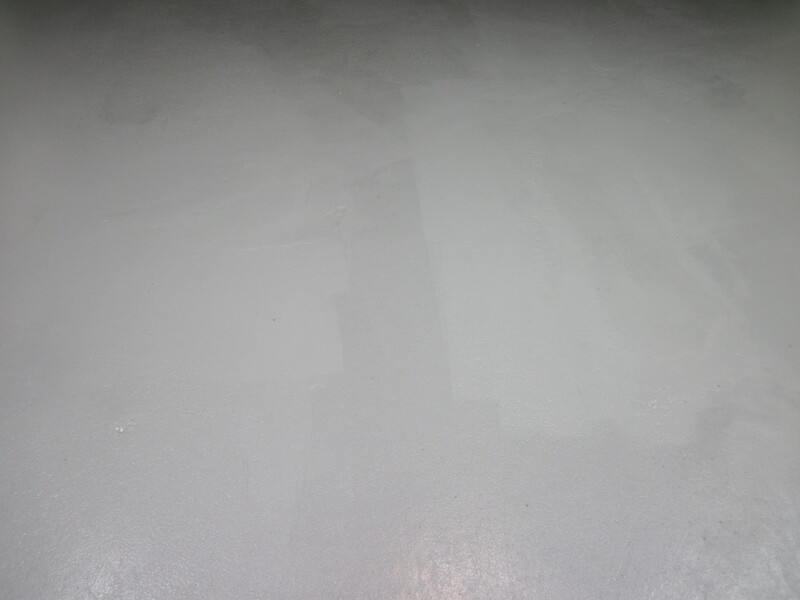 We also read that the clearcoat makes the floor much stronger (one reviewer noted that he frequently welds in his garage and the clearcoat has stood up to the sparks). We were hoping we could get away with one layer of the EpoxyShield and one layer of EpoxyShield Clear Coat, but as we’ll describe in more detail below, we ended up using two layers of Epoxy Shield and one layer of ClearCoat. The simple answer: we followed the instructions in the package. Very very closely. The long-winded answer: The manufacturer’s instructions includes a full page on situations when you should NOT use the EpoxyShield. (This would be more convenient if you knew in advance, so check out the instruction pamphlet online here.) The instructions are different depending on whether you have bare concrete or a painted floor, so keep in mind that what we did relates to bare concrete. 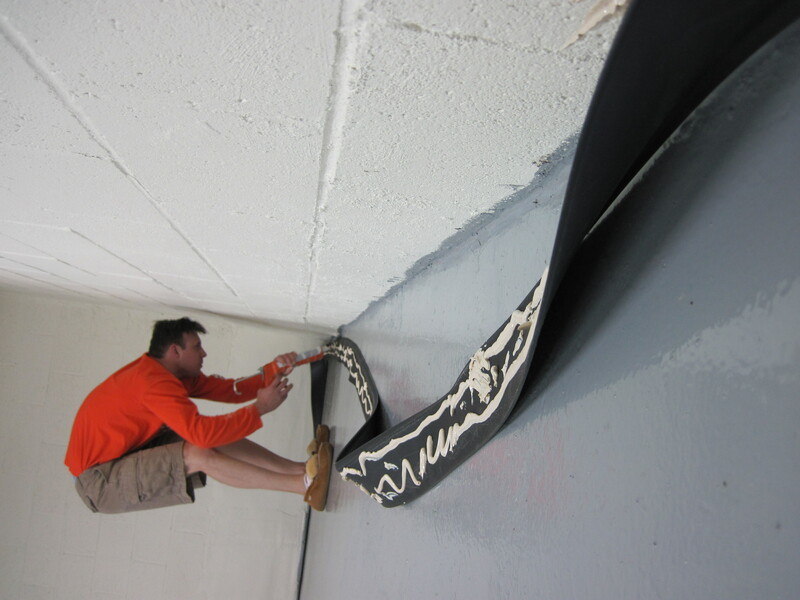 Before we even bought the kit, we patched the cracks in the floor, as we mentioned here. We brought our leaf blower into the garage and blew out as much junk as we could. It’s amazing how much stuff accumulates the concrete cracks so we did as thorough a job as possible. Every review we read emphasized the importance of preparing the work surface, so we weren’t going to take any chances. 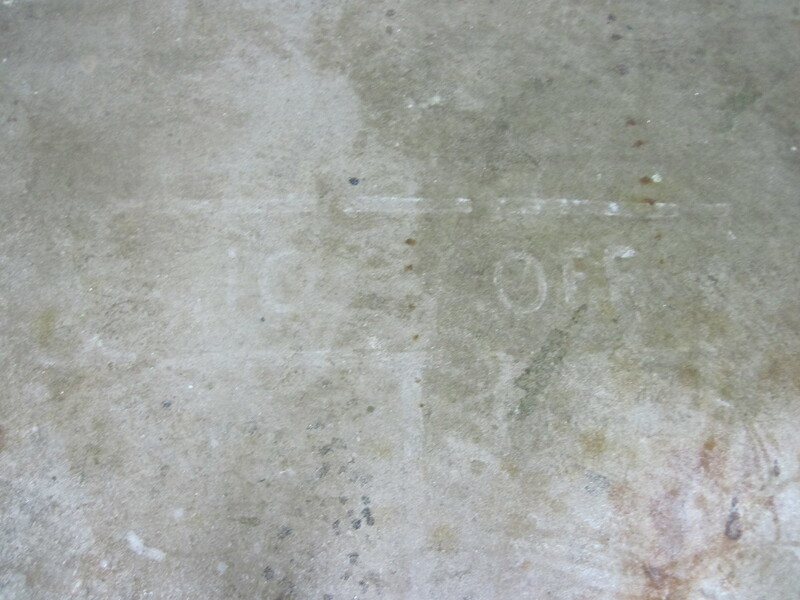 To clean the floor sufficiently for the epoxy to adhere, we had to “etch” the floor. This basically meant that we were supposed to use the chemicals that Rustoleum provided in the kit to get the floor cleaner than merely washing it out. To do this, we picked up a couple of strong bristle brushes from Home Depot and grabbed our houseplant watering can and a 5-gallon bucket. We followed the mixing instructions (stir 2 gallons of water with all of the included chemical). 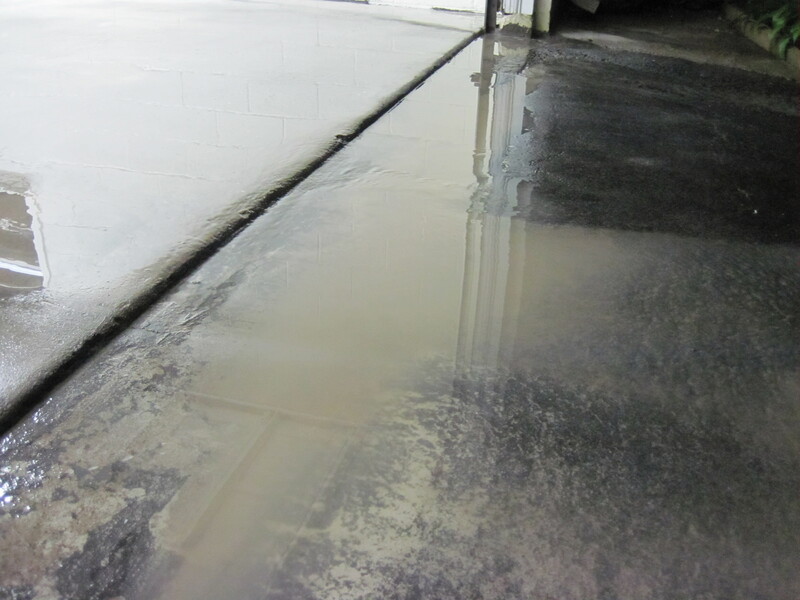 We used our watering can to distribute the etching solution in 4×4 sections of the garage floor. Once the 4×4 section was wet with etching solution, we scrubbed as hard as we could. And then, with more scrubbing, the 10% off sign came off too. After we had scrubbed the living daylights out of the floor (TIP: wear gloves so you don’t get blisters! ), we powerwashed it. The instructions had emphasized the importance of getting all of the etching solution off the floor because the etching solution itself could cause the epoxy to peel up. Also, powerwashing after the etching solution was down helped pull up any dirt and grime that the etching solution loosened, but that we didn’t get when we scrubbed the floor. Step 2: Wait for the Floor to Dry. We waited. And waited. We had to let the floor complete dry out before putting the epoxy down, becuase a damp floor could also make the epoxy peel up. We weren’t taking any chances so we let it dry for a couple days. The instructions outlined a way to test the floor for water (tape some plastic on the floor and see if water beads form on the plastic) but we didn’t want the tape to leave a residue that we would have to etch off again. This is exactly like painting with sticky glue. This part is pretty straight forward but also easy to mess up. The key is patience! Basically, you mix “Part A” with “Part B” and stir for a few minutes. Depending on the temperature outside, you might have to wait 30 minutes or so for the epoxy to activate (it was pretty hot outside so our waiting time was zero minutes). We applied it at about 8:30 p.m., which was not the suggested time, but it seemed to work out pretty well for us. Kristin started painting the edges and then Krister took a roller (1/2 inch nap, with a long extension pole) and filled in the middle. We did not apply the flakes because we didn’t like how they look. We expect that they would help cover up some imperfections in the floor (and any bugs that get stuck in the epoxy while it’s drying). We learned that the key here is keeping a wet edge. If you don’t have a wet edge, you’re going to get roller marks. It’s really hard to keep a wet edge though, so you have to work fast. As we were going, we noticed pretty early on that it started to look splotchy, so we went back and added a second pass in a few areas. That was a huge mistake – once the whole thing dried, you could clearly see where we went back and added more epoxy. We also read that it was important to not close your garage door for a little while (the epoxy will stick to your garage door and make a mess). Oh, and don’t forget that you don’t want to block your walkway – make sure you can get back into the house! Step 4: Wait 24 Hour and Evaluate the Need for a Second Coat. You have to be really careful not to touch or walk on the epoxy for 10 hours after application (and don’t drive on it or put heavy materials on it for 4 days). We waited for a full 24 hours to walk on it, just to be safe. 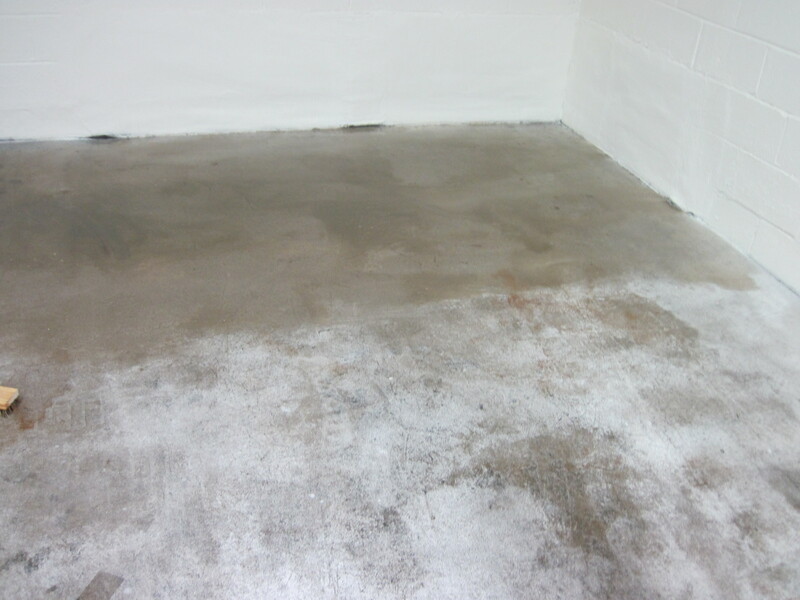 We did a careful look of the floor and discovered that there were obvious roller marks and areas where the epoxy was absorbed by our bare concrete at a different rate than other spots. Not everyone has this experience – it is probably not necessary to do two coats if you have a previously painted floor, but use your judgment. We recommend buying two cases and returning one if you don’t need it. Step 5: If Necessary, Apply a Second Coat of Epoxy. The second time around, we basically did everything the same as the first time. We used the leaf blower to clear out any debris that came in overnight – we intentionally didn’t use a broom because we were worried that the bristles would leave scratches in the epoxy. We painted at 8:30 p.m., mixing Part A with Part B, etc. We decided not to paint the edges with a paint brush. We knew we wanted to apply a rubber wall base as a trim of sorts, so preventing epoxy from getting on the walls was not necessary. Plus, we knew we had to move fast to prevent roller marks. We both got rollers (again, 1/2 inch nap with extension poles) and got to work. We applied a thicker coat the second time, figuring that this would allow us more time with a wet edge and that it would even out some of the texture naturally occuring in our garage floor. 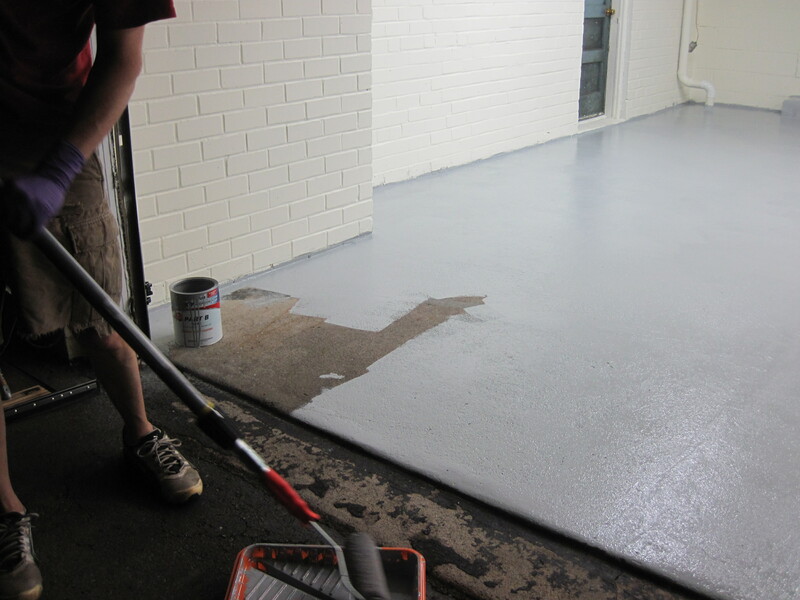 The next day, when we woke up, we decided that the epoxy coating looked a million times better with the second coat. No roller marks (definitely some bugs got stuck in there, but you can only see them if you look closely.) We did not walk on it or anything because we wanted to give it plenty of time to cure. The surface was smoother, but it still retained some of the natural texture of the concrete. Overall, it looked really good and we were very happy with it. Step 7: Apply EpoxyShield Clear Coat. We waited a full 48 hours before applying the Clear Coat. The Clear Coat works the same way, where you mix Part A and Part B together and roll it onto the floor. You are supposed to use a 3/8 inch roller instead of the 1/2 inch, but otherwise everything is exactly the same. Again, we didn’t use a paint brush on the edges, we just rolled the whole thing out. We were worried about the coverage of a package, but one package covered our entire floor. The hardest part about applying the Clear Coat was figuring out what areas you have already done. We unquestionably missed some spots. We also applied some of the left overs in areas we thought we missed and, after it hardened, we determined that the second coat would make the floor considerably smoother (but not worth another $100 for our purposes). The floor has been down for about 4 days now and looks great and feels great under your feet. We have not started driving on it, although we did move one tool chest into the garage (more on that later). We highly recommend using two coats of the epoxy and at least one coat of the Clear Coat. It makes for a great floor, so far at least! Step 8: Install the Rubber Wall Base. The last thing we did to really finish out the floor was apply a rubber wall base. It was pretty easy to do – we just put the wall base adhesive on the back of the wall base and stuck it onto the wall. 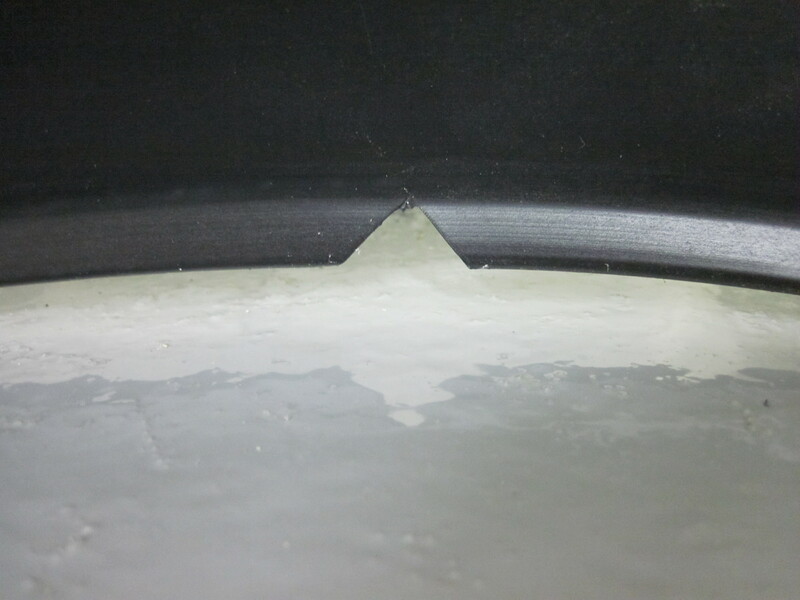 Well, really, first we cut of a little bit of the rubber to do some practice corners (both inside and outside corners). We read a very detailed and useful post about how you’re supposed to do rubber wall base here and then we promptly decided to do it our own way. “Our way” consisted of notching the inside corners and not doing anything for the outside corners. Kristin held down some areas that were not sticking as well on their own, due to bumps in the concrete or corners, while Krister worked his way down the walls. Once the adhesive was dry enough that the wall base stuck well, Kristin moved on to hold down the next corner. Now our garage floor looks Awesome! 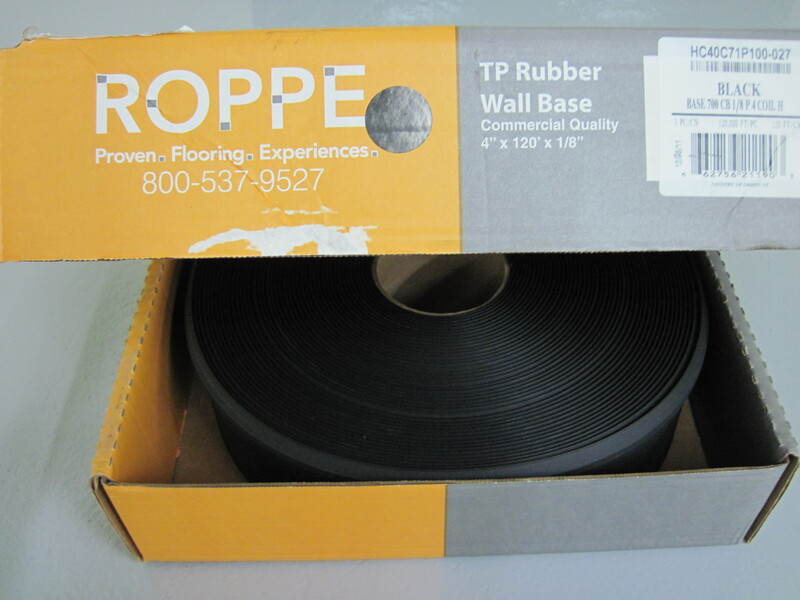 The rubber wall base has adhered very tightly to the wall. It doesn’t budge even if you pull on it. Because There is Always Drama…. On the day we installed the rubber wall base, we got some heavy rain. And then, naturally, we got a leak. And then another leak. And a third leak. 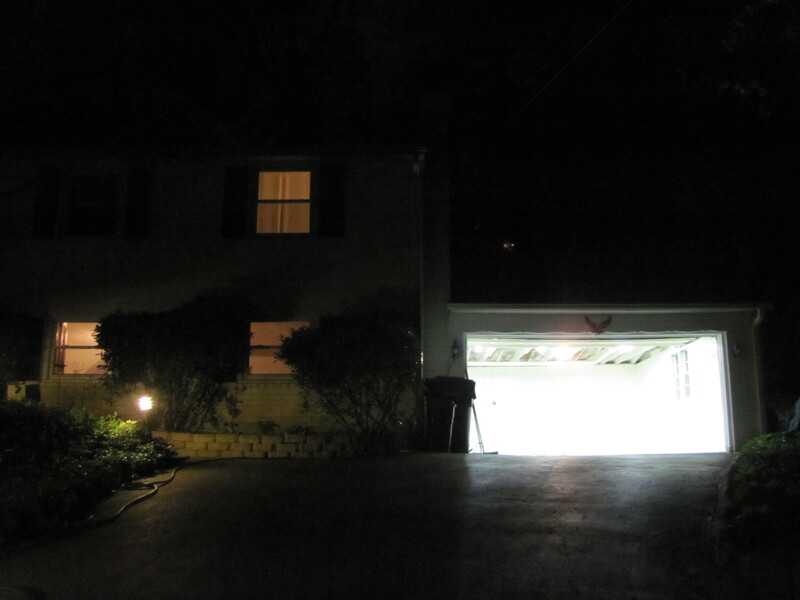 Our initial inspection suggests that the leaks are coming where the garage roof intersects with the house roof, which makes sense because we are confident that the garage was an addition some time after the house was built. We didn’t discover the leaks until after a large puddle of water oozed behind the wet wall base adhesive. It appears as though the adhesive is still adhering adequately, but we might have to do a little repair to that section. See? Our garage is really bright.